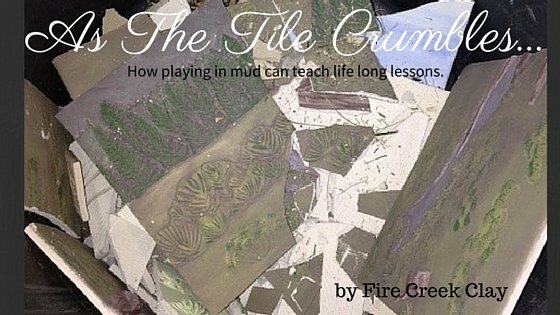 As the Tile Crumbles ~ The Ongoing Saga of a Girl and her Little Bits (of tile). I had decided to pick a picture of my favorite place in Idaho. It is a beautiful photograph of the Sawtooth Mountains surrounded by a lazy meadow at the end of Fish Hook Trail. After my drawing was traced onto a transparency, the image was projected to a large piece of plastic and traced. Confidence coursed through my veins. This was going to be great! Once I pieced together my tile blanks, it was time to start carving. This was my favorite part. I love to carve the clay away to reveal something amazing…something beautiful. The table that I had set up was much too short for the tall stool that I had perched on, so I often carved for hours leaning over the giant slab, but it didn’t matter. Mt. McGowan began to emerge from the flat slab of clay. Trees began to grow and bushes sprouted from nothing. My photograph emerged before me, and I would soon have a tangible picture of my favorite place. It was about 18 hours of carving that I had decided to go ahead and cast each tile. At first, I had never considered it. I wanted this piece to be a one of a kind. The 18 or so hours I had spent bent over a giant slab of clay, the back ache and the tennis elbow that was making itself known; I hated to think that it would all be for nothing if even one tile broke during the drying, or the bisque or even the glaze fire. I had a lot to lose, so I decided to make a trip down to my local Pottery shop for 100 lbs. of potters plaster. It took me another day and a half to make a cast of each tile. Once the molds were dry, I pressed clay into each one and let every tile dry completely. Each tile was an exact match of the original and all had dried completely flat! Yes! I knew what I was doing. Even though I had never done a project this big or detailed before, it was going to work. I had this! It was going to be exactly as I had pictured in my mind. It was time to under glaze my master piece. I painstakingly sat down with a tiny brush and painted my mural with earthy under glazes. It became exactly as I had envisioned. I couldn’t wait to mount it and put it on display at the Art Fair that was coming up the following week. After I had it under glazed, I carefully loaded each tile into my kiln for a bisque. I had never lost a tile during the bisque fire. I was confident that every tile would be fine and ready for me to over glaze in a couple of days. Piece of cake! Well, until I opened the kiln the following day. Each tile I pulled out of the kiln was perfect, except one. Hey, no problem. Perhaps, statistically speaking, one tile out of 12 isn’t bad. Perhaps it was a fluke, perhaps it had a hairline crack before I ever placed in the kiln. No problem, I have a mold. One tile is not a big deal, I can fix that in no time. Putting aside the cracked tile, I over glazed the rest. Here it goes…the final step before I would reveal the mural that I had dreamed of. I carefully set each tile into the kiln and said a small prayer to the kiln god for a successful firing and closed the lid. In 24 hours, I would be reunited with my first mural. I waited until the kiln had reached 120 degrees. Usually, I open it around 250, but really what was the rush. I knew that everything would fire perfectly like it always had. I walked up to the kiln and with my heart beating just a bit faster, I unlatched the lid and opened the kiln. A warm breeze brushed my face, I peered inside and gasped in shock. At first glance, 2 of my mural tiles were split in half. Numbly, I removed the broken tiles from the kiln and set to work taking out the first layer of kiln shelves. I told myself, “it’s alright, two tiles is ok. Displaying my mural for my next show wouldn’t be possible, but I have another one in September. ” I removed the next set of shelves and yelped in pain. The next set of tiles were cracked. When the kiln was completely unloaded, every single tile…12 tiles in all…were cracked in some way. Each tile was tossed ceremoniously into my large garbage can with shock and anger, and I really wanted to cry. There in the bottom of that garbage can sat 84 hours of my life, 50 lbs. of clay and gallons of under glaze. I stared down into the bottom of that trash can, at of all my beautiful broken tiles and sighed. Honestly, I could have promised myself that I would never do another mural again, and I could have admonished myself for trying a mural that was a bit too complicated for my first try. Instead, I stood staring into the pit of the trash can and started thinking.. Now what the hell happened? Well, first of all, I probably took on more than I could chew…I was too big for my britches. Perhaps I should have started with something a bit smaller and a bit simpler to test the waters. I have never been known to do that, I am a jump in with both feet kind of gal and it usually works out…until it doesn’t. My next thought was, what went wrong… obviously I had tried to move through the project too fast, perhaps letting the tiles dry to quickly causing tiny hairline cracks even before the first firing. It could also be too much base relief in small areas putting stress on the clay. As I stood looking over the ruin of my mural, did I think…I will never try this again? No, never crossed my mind. Nope, next time I will slow things down, maybe minimize some of the deep base relief to relieve the stress and give it another go. Why wouldn’t I? It isn’t all about the finished piece. It’s about the journey. There have been a few stumbles this time but I’ve learned things along the way. I will stand up, brush myself off, fine tune a few things and give it another go. As I write this, I’ve determined that clay has taught me quite a few life lessons. I used to be a perfectionist, demanding everything in my life to be just so. Frustrated and angry when things didn’t go my way. If I’ve learned anything working with clay, it’s that life is messy and rarely goes they way you expect. You can either fight it the whole way and be miserable or you can learn from your mistakes and make yourself better. The seemingly erratic behavior of clay has taught me patience, persistence and a little humility, lessons not only for working with clay but working through life as well. Feeling a little frustrated and angry? Have you grown a bit too big for your britches? Find yourself a lump of clay and get to work. Clay will set you straight. It is all about the journey; find joy in the journey.